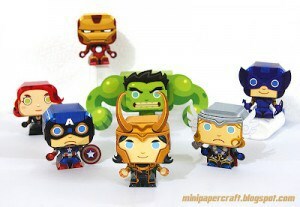 Personal Note: “The Avengers” – totally worth it in 3D, and a cool papercraft! Last night, I went to go see The Avengers. I don’t often go to see movies in the theater, but after seeing the scene that comes after the credits (which I will not link to onYouTube and spoil for you), and 5secondfilms doing a parody of it, I realized I was about to miss out on a bunch of inside jokes if I didn’t see it. First things first: the plot is thin. But, DO NOT GO TO SEE THIS FOR THE PLOT. Let your guard way down (at the 10:30 PM show at Union Square, I think I may have been the only person who was sober), and just go see it. But just don’t go see it, SEE IT IN 3D. It’s almost essential to the “plot”. Which is why I don’t think I can recommend this movie enough. This is the first 3D movie I’ve seen where I feel like the people making the film actually were comfortable with the technology.